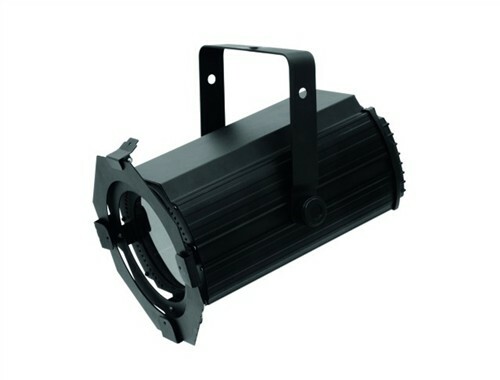 Operable in stand-alone mode or via DMX interface. DMX512 control possible via any commercial DMX controller (occupies 3 channels: brightness, flash-rate and dimmer curve settings). Comfortable addressing and setting via control panel with LCD display and four operating buttons. Functions: dimmer, strobe effect, Master/Slave operation. Dimming intensity and dimmer curves adjustable via control panel. Manually adjustable zoom. Feed-through output allows to power another device. After every 8 devices, the fixtures must have a renewed connection with the power mains. Compact housing in a striking design. Mounting bracket for installation on a stand or a crossbeam. With color filter frame. Optional barndoors available. Color temperature 3200 K. Power connection via Neutrik PowerCon jack and included power cable with safety plug. Switch-mode power supply. Automatic power supply adaption between 110 and 240 Volts without power selector.